Continue bridge demolition operations along northbound Avenue E, between 51st Street and 53rd Street. This work will be supported by Bayonne Police as needed. Continue deep bridge foundation construction in dedicated work zones. During the weeks of 01/09/17 and 01/16/17, bridge demolition will be performed in a dedicated work zone adjacent to Conrail’s Industrial Track near the Route 440 Jughandle to Pulaski Street. During the weekends of 01/21/17 and 01/28/17, NJ Transit Light Rail Service between 34th Street Station in Bayonne and Danforth Avenue Station in Jersey City will be maintained via NJ Transit bus service. During this period, bridge demolition will be performed over the NJ Transit and Conrail train tracks. Please CLICK HERE for details. During the weekends of 01/21/17 and 01/28/17, NJ Transit Light Rail Service between 34th Street Station in Bayonne and Danforth Avenue Station in Jersey City will be maintained via NJ Transit bus service. During this period, bridge demolition will be performed over the NJ Transit and Conrail train tracks. 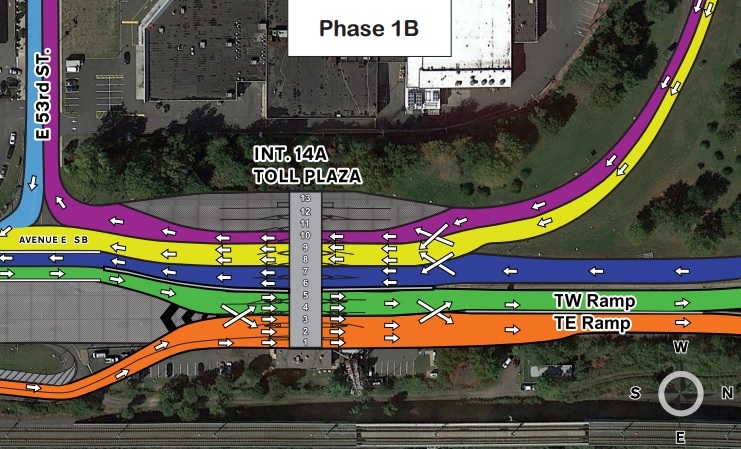 A new traffic pattern has been implemented exiting the Toll Plaza into Bayonne. Please CLICK HERE for graphic. During the week of 12/19/16, deep bridge foundation construction and drilled shaft construction resumes in dedicated work zones. On 12/15/16 at 9:00AM, northbound Avenue E between 50th Street and 51st Street will be temporarily shifted right. On 12/16/16 at 7:00PM, the Roundabout access to the Toll Plaza from southbound Avenue E immediately south of 52nd Street will be temporarily closed. 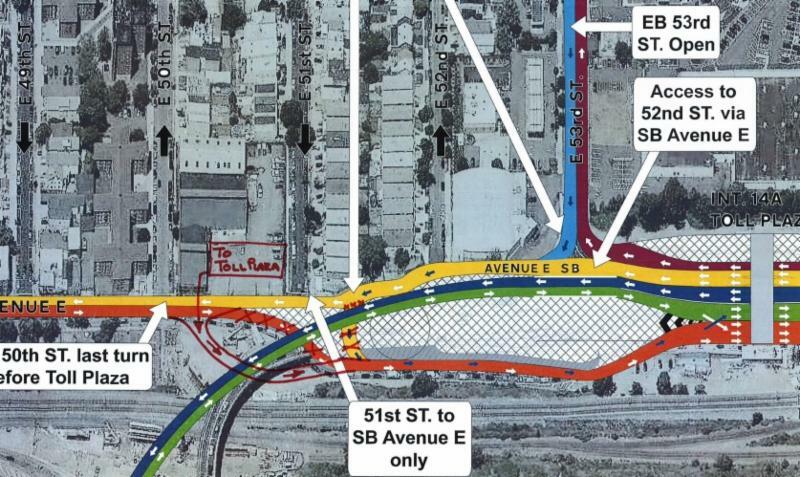 Access to the Toll Plaza will be shifted immediately south of 51st Street. 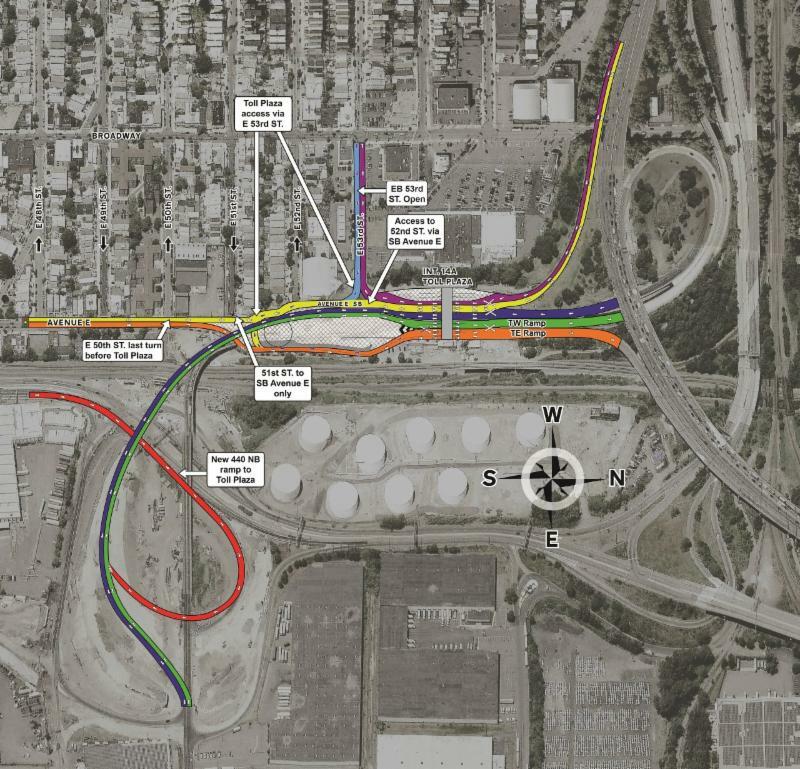 These temporary traffic changes are being made to accommodate bridge demolition operations. The traffic alignment and Toll Plaza access via the Roundabout will be restored at 8:00AM, 12/18/16. This work will be supported by Bayonne Police. Local street level work at Garfield, Avenue C and JFK Boulevard bridges continues. This work will be supported by Jersey City and Bayonne Police as needed. During the week of 12/12/16, nighttime work will be performed on the eastbound and westbound HCE, 9:00PM to 5:00AM, requiring single lane closures to install new sign structures. This work will be supported by State Police. During the week of 12/12/16, resume demolition work on the existing (old) bridge structure in dedicated work zones. Traffic has been shifted onto the new Connector Bridge in a two-way temporary traffic pattern. Please CLICK HERE for graphic. During the evening of 12/08/16 (Thursday) at 8:00PM, traffic entering and exiting the Toll Plaza from Port Jersey Boulevard will be shifted onto the new Connector Bridge. Please CLICK HERE for graphic. Continue construction of new bridge deck. This work will be supported by Bayonne Police as needed. During the evening of 12/08/16 (Thursday) at 8:00PM, traffic to and from Port Jersey Boulevard and Route 440 will be shifted from the old bridge onto the new Connector Bridge. Bayonne and Jersey City Police will support this work. Please CLICK HERE for graphic.